You can whip up easy skillet pasta and fried rice dishes anytime if you keep some key frozen foods on hand. 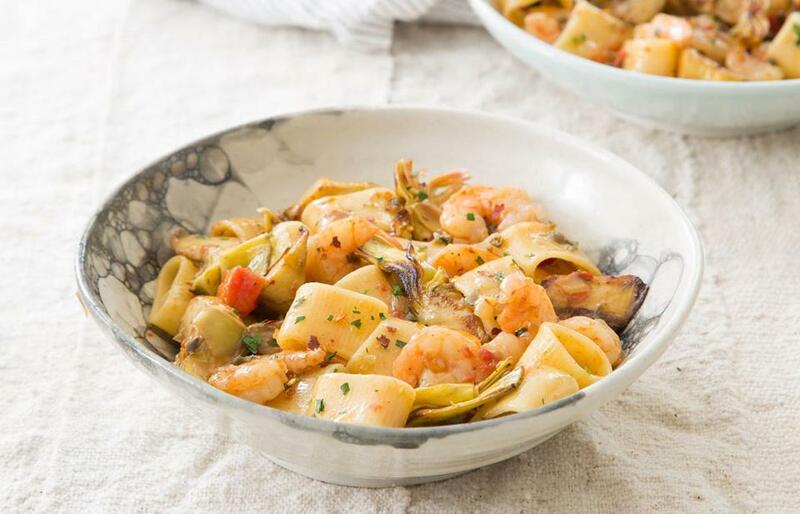 Skillet pasta with shrimp, artichokes, and capers. To facilitate dinner on harried nights, a well-stocked freezer with ingredients that are ready to roll can be a real timesaver (ditto supermarket salad and antipasto bars). Frozen shrimp, artichokes, mushrooms, and pearl onions speed up skillet pastas, and frozen cooked rice steers a pan of hot fried rice into the express lane. In fact, I think that the freezer aisle-assisted fried rice is great any time, from breakfast (think of it as a grain bowl) through dinner. In a very large straight-sided nonstick saute pan or skillet over medium-high heat, heat 1 tablespoon of the oil until shimmering. Add the artichoke pieces, sprinkle lightly with salt, and toss to coat with oil. Arrange the pieces with 1 cut side down and cook, undisturbed, until browned on the bottom, 4 to 5 minutes. Turn the pieces so another flat side is down and cook until browned, 4 to 5 minutes longer. Scrape into a bowl. When cool, cut the larger pieces into bite-size chunks and set artichokes aside. Adjust the heat to medium, add the remaining 2 tablespoons of oil, and heat until shimmering. Add the onion and ½ teaspoon salt and cook, stirring, until softened, about 4 minutes. Add the garlic and red pepper flakes and continue to cook, stirring, until fragrant, about 40 seconds. Add the stock or clam juice, wine, tomatoes, ¾ cup water, pasta, and 1 teaspoon salt, stir, adjust the heat to medium high, and bring to a strong simmer. Partially cover the pan and simmer, stirring occasionally, until the pasta is nearly al dente, the liquid is mostly absorbed, and what remains is thickened, about 9 minutes. Adjust the heat to medium, add the shrimp, capers, and artichokes, and cook, stirring, until the shrimp are opaque and just cooked through, about 2 minutes. Add most of the parsley and black pepper to taste, and stir to incorporate. Adjust the seasoning with salt and black pepper if necessary. Serve at once, lightly drizzling each portion with oil and sprinkling with remaining parsley. The skillet pasta with shrimp, artichokes, and capers uses bottled clam juice or fish stock. 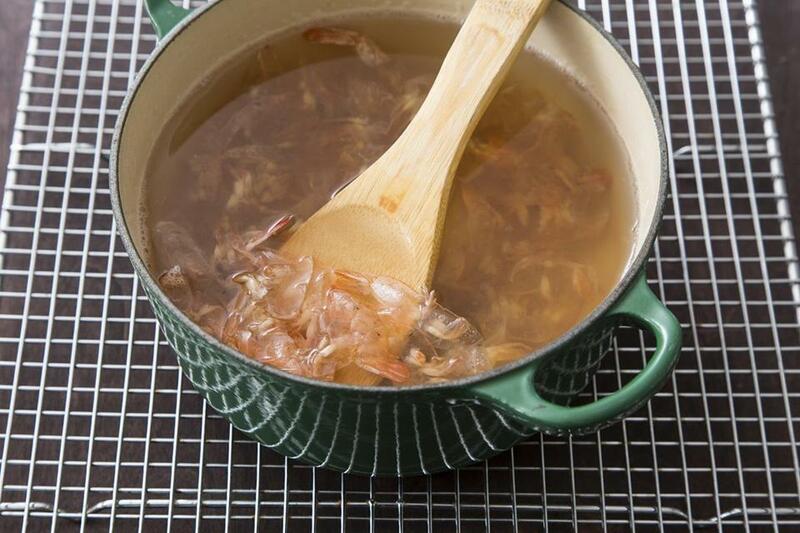 If you have neither on hand, make an easy shrimp stock by simmering the shells in water for about 15 minutes. Strain the liquid and it’s ready to use. Both brown and jasmine rice are available frozen, as are whole and cut-up asparagus spears. In both cases you can use either, and in both cases I prefer the former. Oyster and soy sauces are salty, so taste the dish before seasoning it with extra salt. To make this dish even more substantial, add about 12 ounces of thawed frozen shrimp, shelled and deveined, along with the asparagus, peas, and cooked bacon at the end. If you do, increase the cooking time by about 2 minutes to allow the shrimp to cook through. In a small bowl, beat the eggs with ½ teaspoon salt and pepper to taste, and set aside. In another small bowl, mix the oyster and soy sauces, and set aside. In a very large nonstick skillet over medium heat, cook the bacon until rendered and lightly browned, 4 to 7 minutes. Drain on paper towels, and when cool, chop roughly and set aside. Pour off and reserve all but 2 teaspoons of fat from the skillet, return it to medium heat, add the eggs, and cook, without stirring, until edges begin to set, about 30 seconds. With a heatproof, nonstick-safe spatula, lift the edge of cooked egg and tilt the skillet so that uncooked egg runs underneath. Repeat around perimeter until no runny egg remains and cook, undisturbed, until the bottom is spotty brown and the top is just set, 2 to 3 minutes. Slide the omelet out of the pan and, when cool enough to handle, cut into ¾-inch-by-2-inch strips (you should have about 1¾ cups), and set aside. Return the skillet to medium heat, add 2 teaspoons of the bacon fat, and allow to heat for a moment. Add the onion and ¼ teaspoon of salt and cook, stirring, until softened, about 4 minutes. Add the rice and the oyster sauce mixture and cook, stirring constantly, until the rice is hot, about 7 minutes. Make a space in the center of the pan, add the sesame oil, and allow it to heat for a moment. Add the garlic and ginger and cook, stirring and mashing, until fragrant, about 1 minute. Add the asparagus, peas, and cooked bacon, adjust the heat to medium-high, and cook, stirring, until the vegetables are heated through, about 2 minutes. Add the egg strips and pepper to taste and continue to cook, stirring, for 1 minute longer. Adjust the seasoning with salt and pepper if necessary. Add most of the scallions and stir to distribute. Transfer the fried rice to a heated serving bowl, sprinkle with remaining scallions, and serve at once. Frozen mushrooms exude a lot of liquid — after about 10 minutes in the pan, I had almost „ cup. To save yourself the roughly 5 minutes of cooking time it takes to evaporate that liquid before the mushrooms begin to brown, you can strain it into a measuring cup to use in place of the water in the recipe. If you don’t have fresh rosemary on hand, substitute dried Italian herb mix or dried thyme, crushed with your fingers. In a very large straight-sided saute pan or skillet over medium-high heat, heat 1 tablespoon of the oil until shimmering. Add the frozen mushrooms and ¼ teaspoon salt and cook, stirring occasionally, until mushrooms have exuded their liquid (at this point you can strain off and reserve the liquid to add to the pasta; see note above). Continue cooking, stirring frequently, until the liquid has evaporated and the mushrooms begin to brown, 5 to 10 minutes longer. Scrape the mushrooms into a bowl (you should have about 1½ cups) and set aside. Add about ¼ cup of the chicken broth and scrape the bottom of the pan to dissolve any fond; pour the broth into the bowl with the mushrooms. With a chicken breast half laid flat on a work surface and a knife blade held parallel to the surface, cut from end to end to make 2 thin cutlets. Repeat with other half. Blot cutlets dry. Return the pan to medium-high heat, add 1½ teaspoons oil, and heat until shimmering. Sprinkle both sides of the cutlets lightly with salt and black pepper, and cook, undisturbed, until browned on the bottom, about 2½ minutes. Turn and continue to cook until the second sides turn white and cutlets appear cooked through, about 1 minute longer. Transfer the cutlets to a plate. When cool, bias-slice them into thin pieces and set aside. Return the pan to medium-high heat, add 1 tablespoon of oil, and allow it to heat for a moment. Add the frozen pearl onions (they may sputter) and ¼ teaspoon salt and cook, stirring occasionally, until liquid has evaporated and they are browned in spots and tender, about 6 minutes. Scrape the onions into the bowl with the mushrooms. Add another ¼ cup of the chicken broth and scrape the bottom of the pan to dissolve any fond; pour the broth into the bowl with the mushrooms and onions. Adjust heat to medium low, add the remaining 1 tablespoon oil to the pan and allow it to heat for a moment. Add 1½ tablespoons of the garlic, rosemary, and crushed red pepper flakes and cook, stirring, until fragrant, about 1 minute. Add the wine, remaining chicken broth, reserved mushroom liquid or „ cup water, 1 teaspoon salt, and pasta, stir, adjust the heat to medium-high, and bring to a strong simmer. Partially cover the pan and continue to simmer, stirring occasionally, for 6 minutes. Add the cream, stir, and continue to cook, uncovered, until the pasta is nearly al dente and the liquid remaining in the pan is thickened, 2 to 4 minutes longer. Adjust the heat to medium, add the mushrooms, pearl onions, chicken, and remaining 1½ teaspoons garlic and cook, stirring, until the whole mixture is hot, about 2 minutes longer. Add the Parmesan, most of the parsley, and black pepper to taste, and stir to incorporate. Adjust the seasoning with salt and black pepper if necessary. Sprinkle with the remaining parsley. Serve at once, passing Parmesan at the table. Adam Ried appears regularly on “America’s Test Kitchen.” Send comments to cooking@globe.com. Follow us on Twitter @BostonGlobeMag.